The area around Freeman’s home town, Mokelumne Hill, seemed like a good place to begin. During the Gold Rush days, strikes in and around the village produced some $10,000,000. In those days the easiest way to find gold was to turn over rocks in the riverbed and just pluck out the nuggets. Some of them were really big. Mexican Argonauts named a nearby town Melones (melons) for the nuggets they found. Nobody appears to be turning up gold melons these days, but Freeman maintains that there’s still gold in them thar foothills. Today he prospects just as his ancestors did. The prerequisites are a strong back, lots of patience and a wide rimmed shallow pan. With this pan he rinses the riverbed soil in water, using a rotating motion to progressively discard the dirt while the heavier gold sinks to the bottom. The consolation for not finding gold is that the Mokelumne River is so awfully pretty. The real fun is feeling the sunshine on your face, listening to leaves rustling in the wind. The water sparkles, the surrounding mountains are covered with trees—not a house in sight. The only change since Gold Rush days is that it’s quiet now. Nobody’s drinkin’, shootin’ or spitting tobacco. Imagine that same river 150 years ago. Both banks lined by hundreds of miners, tents and mules. I did encounter one other panner that afternoon. He was George DeBem, a business man who likes to prospect on weekends. DeBem says he averages five nuggets a day and takes them back to Fresno in a briefcase. His homemade sluice box does most of the work. The sluice imitates the river, trapping the black sand and gold with its natural riffles. It catches and holds the gold, but in a concentrated way, reproducing in a small area what the river does large scale. DeBem pointed out the features of his foot-long sluice box. The river water is channeled through an open ended trough over metal lath which acts likes cracks or crevices. Toweling holds the gold like moss does. Wooden riffles imitate natural riffles in bedrock. The gold bug was really biting me by then so I decided to consult the legendary Cate Culver. Culver, resource coordinator at the Calaveras Historical Society in San Andreas, has been panning since she was ten. She learned the art from her grandmother who honed her own skills as a child in the 1890s. “Grandma gave me my first pan—a metal one—but now I prefer the black plastic ones because you can see the gold better,” Culver explained. I liked her optimism. After all, you have to find gold to see it. Culver has found so many nuggets over the years that she can’t keep track of them all. Many have been combined and then made into pendants and earrings. She wears a beautiful, intricately carved wedding ring made from gold that her husband found. Besides her trusty plastic pan, Culver has other tools that can be acquired in any hardware store in the Sierra foothills. One called a sucker looks like a turkey baster only with a thinner snout. When Culver walks down to the stream she looks at the configuration of the water. Where does the stream bend, straighten, part? Where does the water go fast, where does it drop? That dropping part is important because it generally happens right before a mud bar. That’s where the gold goes. I suspect the mystique goes deeper than that. The sense of freedom and equality connected to panning in the Sierra foothills is truly unique. For centuries there have been gold strikes, but the treasure always belonged to the pharaoh, the caesar, the czar, the kaiser, the king. Historically, miners worked their tails off for one government or another. The discovery of gold in a virtually unclaimed wilderness changed all that. The Gold Rush that ensued was literally a free for all. And, to some extent, it still is. Though choice spots are frequently located on private property—you need permission to pan there—many others are not. Much of the historic Mokelumne River is readily available to panners as are spots on the Calaveras River. New Hogan Dam outside San Andreas on the Central Hill Road has fishing and panning access. Most gold is hidden from view, but my gold digging instincts rushed to the surface. “The Luck of Roaring Camp” had been a favorite tale since school days. When I discovered that there really was a Roaring Camp—the very same Roaring Camp that Bret Harte immortalized —and that people are still panning there, I determined to try my own luck. The excursion left from Pine Grove at 5 p.m. About fifty people climbed onto two open trucks. As we inched our way down a six mile grade, a guide regaled us with stories. Spanish priests and soldiers had preceded the miners in the early 1800s. We saw fig trees planted by the former and a giant foxhole dug by the latter. He also pointed out the miners’ hanging trees. Claim jumping was unquestionably a no-no and miners’ justice swift. Miscreants were summarily executed up through the 1920s. The mine closed during World War II but reopened soon after. Roaring Camp is still a working operation. Interspersed with the narrative were excited comments from fellow passengers. Everyone knew someone who’d found gold somewhere, at some time. There was talk of nuggets worth $75. The descent to Clinton Bar is precipitous but once at the bottom, the breathtaking scenery makes anything worthwhile. The Mokelumne River Canyon is narrow, the meandering river bordered on either side by lush forest and almost vertical mountains. It’s another world. Visitors stay for an evening or a summer. They can be as active or inactive as they please. I met Mary Scott of Stockton who’d brought a suitcase filled with paperbacks and never cracked one. All her time was spent panning. I also talked to Bill Mullens of Tracy who’d planned to pan and ended up back against a tree, feet dangling in the water, devouring one old west novel after another. Eventually, I hooked up with Bob Scruggs, a veteran miner who said he found a 38-pound nugget in 1961 and never left Roaring Camp. Scruggs showed me around the museum where I saw an amazing collection of retired pans and shovels. They’d seen a lot of action— possibly 150 years of it. There were stuffed cougars and bears too. I wondered if any of their live relatives lurked outside. Scruggs pointed out the mine operation, then lead me at last to a very large pile of dirt that had been bulldozed out of the mountain. It looked to be about ten feet high and fifteen feet in circumference. People were shoveling it up, loading it into pans and carrying it down the hill to the stream below. Was this a set up, I wondered. I’d heard stories. . . Some places actually guarantee that panners will find gold because it’s been planted there. I had to ask, “Was this dirt salted?” “Lady!” He looked indignant. “We’re running a gold mine!” What do you think?” I thought I’d better take a shovel. Digging deep into the pile, I dug out a large scoop full and poured it into my pan. Then I walked down the hill to the river and waded out to a flat rock. First I submerged the pan, keeping it level with the river surface. With this water, I puddled the dirt till it looked like thick soup. Then I flicked the edge of the pan into the creek, tilting a little out the far side. I added more water and repeated the process. Finally the gravel was all gone, then most of the “blond” sand. Finally only black ore remained. Once again, I’d done the “good” panning that my original mentor, Bill Freeman, had complimented me on. But it wasn’t good enough. There was no gold in sight. I looked way away. It was nearly dusk. He took pity on me, returning a few minutes later with my pan filled to the brim with new dirt. I took a deep breath and scooped up some water. Then I did the mud pie thing, mooshing the mixture with my hands. Pouring off the excess, I added fresh water and repeated the process, swirling the mixture round and round in the pan. I was getting the feeling of it now. 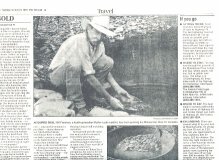 Panning for gold was like mixing a martini. I had the sloshing motion just right. Shake, not stir. The gravel was gone, the light dirt over the side. All that remained was the black sand. . . and then as I sifted through it I saw that glorious glitter. “Eureka!” I’d found it. No attempt made to play it cool. The whole camp knew I’d struck it rich. But after a time I began to consider. It was Charles who’d struck pay dirt in the first place. We were really partners in this mining operation. I saw us embarking on a whole new career. Maybe staking a claim together. “Why don’t we just take your nugget to a jewelry store and see if there isn’t something you can do with it?” Charles is so practical. We went to Gold Mine Jewelers in Jackson. That’s where Bill Freeman takes his nuggets (he wears one great big one as an ear ring) to be made into jewelry. Tom Peyton, a gemologist who owns the store, showed me not only a variety of pendants, rings and earrings but an impressive array of nuggets ranging in price from $20 to $2000. So you see, there’s no need to leave the Mother Lode empty handed. 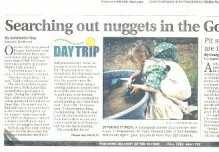 If you don’t find a nugget, you can buy exactly the one you want already panned by a latter day prospector. Who says the Gold Rush is over? Hwy 26 to 49 is a straight shot from Stockton to Mokelumne Hill. For an easily, accessible spot open to the public, turn left on 49 and go 3.2 miles to Electra Road (named for the ancestor of PG&E which furnished San Francisco with electricity.) Turn right on Electra and follow the river. There are many good panning spots but my particular favorite is 1.7 miles east from the turn off. The river runs right through the grounds of the Mokelumne River Lodge and Spa. Guests are invited to pan, fish or gather river rocks to their hearts content. The rooms are lovely and Everett and Catherine Powell serve a great breakfast. Their lodge is located at 10704 Hwy 49—three miles north of the Hwy 26 intersection. (209) 286-1000. Another overnight alternative is the historic Hotel Leger in Mokelumne Hill, at 8304 Main St. The antique-filled inn has a restaurant open five nights a week. (209) 286 1401. The best steak in many towns is served at Wendell’s, at the corner of 49 and Center Street, just north of Hwy 26. (209) 286-1524. There are several ways to try your luck at Roaring Camp. An all day trip from 10 to 5:30 enables you to spend plenty of time exploring the remote canyon still mined much as it was in 49er days. Besides panning, there’s swimming, a mining operation to view and numerous hiking trails. The price is $35 for adults, $25 for children. The Saturday night cookout dinner is a five-hour trip into the canyon leaving at 5 p.m. After a tour of the operation, guests have a panning lesson and then take off on their own. The dinner’s a steak barbecue with delicious fried bread. The price is $36 for adults, $21 for children. Another option is to rent a prospector’s cabin for a week. There’re clean and pleasant. The price is $440 for from one to two people. Activities such as the Saturday night cook out dinner are included. The departure point for Roaring Camp is at the Pine Acres Resort on Hwy 88 just beyond Pine Grove. For information, call (209) 296-4100. Gold Mine Jewelry is located at 37 Main, Jackson. (209) 223-0713. Start off with a pan for everyone in your party, plenty of sunscreen, a trowel, tweezers, tablespoon, shovel, and plastic medicine bottles to put your nuggets in. A snorkel might reveal treasure. At the least, it’s fun to use. If you get really serious about panning, you’ll want a pry bar, sucker, and eventually a sluice. 5) A panner in training. Under the tutelage of Howard Little, a San Andreas realtor, more than 300 third graders learned to pan first hand in the Mokelumne Hill Park, Sept. 9.